50 Powerful memory rhymes that will lock in learning for your students. Give your students the advantage of a lifelong memory of vital information and instant recall of hundreds of key principles. An explanation of how to best utilize ditties in the core areas of study. Why use Ditties? Quick...finish this sentence. "In fourteen hundred and ninety-two..."
I'd bet good money you said "Columbus sailed the ocean blue." That's because rhythmical language is a powerful learning tool. We cannot shake things we learned as rhythms or poems, even if we wanted to. They just stick in ways that other things do not. The humble little ditty is one of the most effective educational tools available, and yet it is also perhaps one of the least used. It’s so unassuming and simple that it seems improbable that it could carry the learning power that it does. 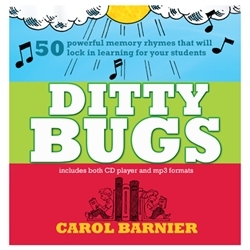 Unleash the power of the ditty in your student's life! CD, MP3, and PDF files are included.